When you’re writing sales copy for your business, showing a little personality is a good thing. It’s also a good idea to use natural language whenever possible, so people know you’re a real person who is genuinely interested in helping your prospects and customers. I write conversationally when I write copy, and so do a lot of other folks I trust and admire. However, there are limits to how far you should take that advice. Are you taking a risk when you use slang? Unless you have proof that your audience uses slang — and wants to see it in sales copy — you should avoid using it in your persuasive emails, sales pages, and other types of “selling” collateral. And when I say “slang,” I’m also including alternative spellings, slang abbreviations, and hyperbole. I know there’s a high probability I sound like an old grandmother shouting at kids to stay off her lawn — but lately I’m seeing this trend more and more frequently in sales copywriting. And I suspect it’s radically decreasing conversions. Chances are, you’ve got your own list of words that annoy you when you see them in professional writing. My list could go on for a while, but I’ve chosen some of my biggest pet peeves. I wince every time I see those words in an email from a business. There’s a compelling reason to avoid slang and abbreviations like the ones on the list above: they often don’t add value to your copy — and can actually distract your prospects. When your prospective buyers read your sales page and decide whether or not your product is a good fit for them, you don’t want to distract them for a single moment. You want every line of your copy to flow seamlessly into the next, without interruption. If you sprinkle your sales page with slang and nonsense words, there’s a good chance you’re going to interrupt that flow. At best, the “OMG” is only a temporary distraction that slows down prospects’ decision-making processes as they read. At worst, the slang and misspelled words will turn off readers so much that they abandon your sales page forever — and you’ve just lost them as customers. Slang words and abbreviations that belong in text messages also don’t add any value to your copy. As sales copywriters, we must choose every word carefully. Every word and phrase on the page needs to pull its weight — slang and overused exclamations like “OMG” just don’t cut it. Perhaps in certain circumstances you’re correct — there are exceptions to this rule, of course. If you performed extensive research and know for certain your prospects use this type of language — and want to see it in sales copy that promotes your product or service — you might be able to get away with using it. You should test out these words and phrases to see if including them increases your conversion rate. If they don’t, I recommend cutting them. Even if your prospect tolerates these words and phrases, they’re probably not contributing anything to your copy. If you’re looking for more tips on how to make your copy tighter, more readable, and more persuasive, check out Copyblogger’s free ebook Copywriting 101: How to Craft Compelling Copy. The 90-page ebook is packed full of helpful advice, including more thoughts on audience research and using your prospect’s preferred language. Do certain words irritate you when you see them in professional copywriting? Or are there any you’re guilty of using (or overusing) yourself? Tell us about it in the comments below. Beth Hayden is a copywriter, content writer, and content marketing expert. She helps businesses with copywriting projects like sales pages and email sequences, as well as high-quality ghostwritten content for their websites. Find out more at BethHayden.com. Thanks for this post. Absolutely necessary, in particular, if you want to reach an international audience! The newest phrase that absolutely irks me is ‘just for you’. This insults my intelligence as everybody knows that this type of content tries to reach as many people as possible. You seem to be putting the onus on the copywriter to prove that adding these sort of slang words improves the sales message, but you don’t show any solid proof that it detracts either? I think you are probably right that you can confuse some people with unfamiliar and non standard English, but perhaps you can also excite users with such language? Either way it would be nice to see some stats on this. I think you have to trust your gut, Phil, and if there is a good reason to use slang and text-message abbreviation, try them out! I think the onus for decisions like this are always on the copywriter! Indeed. Even when trying to persuade millennials, don’t try to write like one unless you are one. They’ll be on to you quickly. Imitation is definitely not flattery within this context – it’s a turnoff. I absolutely agree with you. Style of communication is very important to convert people into customers; just a wrong word to frustrate our efforts. Great article! For my own writing, I’m with you on leaving out the non-standard English. Unfortunately, however, I’ve read this piece twice and I can’t find a single shred of evidence in it. I would love to be convinced that this is something other than the author’s opinion. You *assume* that slang is distracting. However, for some audiences couldn’t it be what makes the difference between boring, ho-hum copy and text that actually connects with those readers? Vocabulary is a huge part of persona and positioning. It is, Marcia, and that’s exactly why I advise testing it yourself if you firmly believe your prospects would respond well to a particular kind of language. I haven’t seen any specific studies on how these kinds of words test in the field, because I think conversion studies like that wouldn’t hold up when you try to write for different audiences. I have read that it takes a reader 5-10 seconds to decide if they want to stay on a web page (https://www.nngroup.com/articles/how-long-do-users-stay-on-web-pages/) so I think cutting out words that don’t add meaning or depth makes sense under those circumstances. The point of my article is common sense advice: Cut these words, or test them to see if they act work for you. I agree with you. It’s good to write conversationally … but you need to be careful, as you point out. My favorite “voice” is to write in a ‘business casual’ tone. Another thing to watch out for is local dialect. Some folks forget that. For example, what may be a common term for me in Arkansas may not be so common in other areas of the country and world. In fact, it may carry a whole other meaning, sometimes with a negative connotation! Thanks for the article. Will be sharing this one! Yes, it’s too bad people must be reminded to not use text messaging abbreviations in their sales materials. Maybe writing copy to high school kids has a different set of rules, but I’m not going there. So good to see that the phrase ‘that said’ is not anywhere to be found in this article. The best thing about this article is the headline. Unfortunately, the copy doesn’t come up to my expectations. At all. 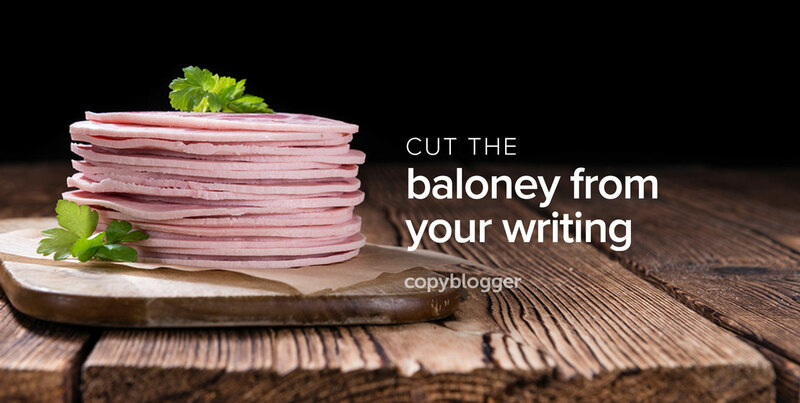 I generally like the Copyblogger articles. I’m a long time subscriber, but this one really is thready. Not very insightful in the year 2016. Maybe it’s killing conversions – maybe not. We can decide, if we test it. And: You should really change the headline. As a matter of fact this blog post is NOT about “how to” cut words. Let alone “ruthlessly”. No offense intended, but this was not a very pleasurable read. Sorry you didn’t love this article, Gavin, but some Copyblogger pieces are indeed opinion pieces (like this one). The information I’ve shared in this post is based on my 10+ years of experience as an online marketing coach and writer. I wanted to share my professional opinion with the hope that it would spur discussion, and it certainly has…with people agreeing and disagreeing with my main point. Thanks for an interesting article. I agree that slang can be very off putting. As I read your article it made me think of the saying ‘Familiarity breeds contempt’. With all business relationships, no matter how well you know your clients and get along with them, you should always maintain an attitude of professionalism. The same applies to your sales copy. It’s a matter of respecting the business/ professional relationship. Beth, OMG, this post FREAKING ROCKED! BOOM! Pleeeez, write more, LOL. Really though, indiscriminate use of slang or words that have some ephemeral currency can cause readers—and I’m one, so there’s my evidence—to say “WTF?” and move on. BOOM! Valid points, yet some writers have developed their unique voice in their blogs and emails, and a following along with it, using lots of slang. Ben Settle is one example. Carlton does it regularly also. I can’t remember ever using slang. And whenever I’m reading a sales copy and encounter one it makes me grimace. I think, writing conversationally is ok for most blog-posts. However, some writings with slang are so offensive as soon as I see them I immediately click-away. Thanks Beth, great article. Love it! As my opinion, using slang words can create a bad impression about that product/service. Seems to me like there is an industry standard pallet of words that get sprinkled all over sales copy. I mean, who searches for these words? To me, none of these words add value and whiff of hype, if not scam. These words in the mail subject of an email result in instant deletion from my inbox. What I do like, though, is honesty and openness. If there is value for me within that then I can see it easily and make a rational decision rather than going to the trouble of buying something and then the trouble of applying for a refund. Sure, you might get away with that strategy once or even twice but soon your name will be marked down like a snake-oil merchant. That’s what’s really insane and can lose you a ton of money. I’ve received email from long-time customers with smiley faces in them. I let it slide because of the “long-term customer” part, but it still struck me as unprofessional. Casual and conversational are fine — I specialize in those — but at some point we must wear our metaphorical pants. Meanwhile, cutting unnecessary words is always welcome. My website quotes a guy who notes in 1971 that people would rather read two 3000-word articles than one 6000-word article. I’m also certain that Shakespeare the author learned from Shakespeare the actor that you hit your mark and move on. If we all had to recite our writings in front of an audience every day for a few months, we’d cut every word that didn’t clarify our meaning. How’s this for an opening line I’ve just read in an email sent from teachable..
‘We missed you like WHOA. Maybe someone asked their 14 year old to give writing a bash. I also hate ‘freaking, awsome, stoked’, and ‘crushing it’. I agree with you on those, Kevin – especially “stoked” and “crushing it”! I think the latter has become really overused in the last few years. This article is awesome. Totally agree with the slang part. While I’m not guilty of such, I could definitely imagine it! I have seen it myself a couple of times, so yes! Thanks for sharing this and I totally appreciate it! Thanks for the post Beth! It’s always good to pay attention to the quality of your content. So to maintain good quality avoid using Slang in your content. Thank you, Beth, for the insights and to everyone for the comments. As an aspiring copywriter, the topic was interesting and informative. I coudn’t agree more, It’s defentley audience depended. Doing extensive reaserch while carefully testing is the prefered choice.